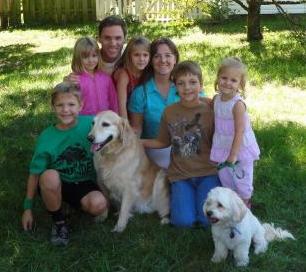 Dr. Trisha Kvasnica is a 2000 graduate of Kansas State University School of Veterinary Medicine. After graduation, she has practiced for the coorporations of Banfield and VCA (Vet Centers of America) as well as the three local vet clinics: Little Apple Vet Hospital, Westside Vet Clinic and now Blue Hills Veterinary Hospital. For the last five years, she has specialized in house calls, particularly home euthanasia. She also performs routine sterilizations for the animal shelter and the humane society with the assistance of current veterinary students. Dr. Kvasnica is married to Andrew Kvasnica who manages parts of the operating room at Mercy Regional Health Center and they have five children. Dr. Kvasnica spends most of her time at home raising her family and homeschooling, but enjoys all aspects of veterinary medicine as well. Besides the children, other animals in the house include a rescued dog named Chance, Mac the guinea pig, a rescued cockatiel named Axel and a goldfish named Julius.